Fremantle is renowned for its well-preserved architectural heritage, including convict-built colonial-era buildings, an old jetty and port and prisons; presenting a variety and unity of historic buildings and streetscapes. These were often built in limestone with ornate façades in a succession of architectural styles. Rapid development following the harbour works gave rise to an Edwardian precinct as merchant and shipping companies built in the west end and on reclaimed land. The Round House, the oldest remaining intact building in Western Australia, was built as a gaol between 1830 and 1831. The Round House had eight cells and a gaoler's residence, which all opened up into a central courtyard. In the 1800s, bay whaling was carried out from Bathers Beach below the Round House. As part of the whaling operations, a tunnel was constructed under the Round House to provide whalers with access to the town from the jetty and beach. The Round House is located in what is now known as Fremantle's West End: a collection of streets characterised by late Georgian and Victorian-style architecture at the southern end of the port. A process of gentrification in the early 1990s was accelerated by the establishment of the University of Notre Dame Australia, which occupies, and has restored, many of the buildings in the West End. The Fremantle Arts Centre is another building constructed in the 1860s by convicts from locally quarried limestone: it is a former lunatic asylum building on Ord Street, and is one of Fremantle's most significant landmarks.Today the imposing Victorian Gothic building and its historic courtyards are used for art exhibitions and music concerts. When the first 75 convicts arrived from Britain in 1850 to support the colony's dwindling population, it became apparent that the Round House was inadequate to house them. The convicts built a new gaol, Fremantle Prison, which was completed in the 1850s and continued to be used as Fremantle's prison until 1991. Fremantle Prison was once one of the most notorious prisons in the British Empire. It housed British convicts, local prisoners, military prisoners, enemy aliens and prisoners of war. 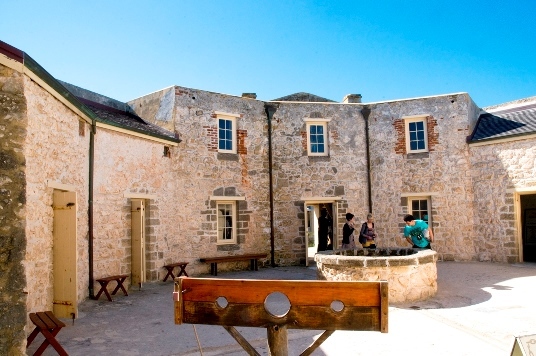 On 1 August 2010, a meeting of the UNESCO World Heritage Committee in Brazil placed Fremantle Prison and 10 other "Australian Convict Sites" on the World Heritage List - making it the first built environment in Western Australia to be bestowed this honour. It continues to be accessible to the public for guided tours and as a venue for artistic and cultural activities. The Fremantle Markets opened in 1897, forming a precinct providing handicrafts, speciality foods, dining halls and fish and vegetable markets. The area also hosts buskers and other street performers. The then premier, Sir John Forrest, laid the foundation stone for the markets on Saturday 6 November 1897. Over 150 stalls are housed in the Victorian-era building, which was listed by the National Trust of Australia and the state's Heritage Council in 1980. For a list of state, national and world heritage listings in Fremantle click here.